American manned spacecraft. Study 2012. Boeing's CEV consisted of a four-crew Apollo-type capsule, a service module, and a pressurized mission module. Status: Study 2012. Gross mass: 20,000 kg (44,000 lb). Unfuelled mass: 10,500 kg (23,100 lb). Height: 10.50 m (34.40 ft). Diameter: 4.50 m (14.70 ft). Earth Departure: A 20 metric ton payload man-rated launch vehicle would put the CEV into orbit (this could be an Atlas WBC Phase I; Delta IVM+(5,6); or a Shuttle-derived SDLV RSRM stick booster). A 45 metric ton payload Cargo LV unmanned launch vehicle would put other elements into orbit (orbit (this would require a payload fairing with a 6-m inside diameter, and could be an Atlas WBC Phase II; Delta IV-H(6.5,6); or an SDLV Side-mounted payload booster). The spacecraft would be assembled in a 400 km altitude, 28.5 deg inclination low earth orbit. The four-crew CEV would dock with the separately cargo-launched EDS Earth Departure Stage in LEO, then head for L1. Separately, an EDS with the LSAM lunar lander would also proceed to L1. The EDS and LSAM would use liquid oxygen/hydrogen propellants. Specific impulse would be 465 seconds for the EDS and 455 seconds for the LSAM; mass fractions would be 17.9% and 18.1%, respectively. 596 m/s of delta-V were allowed for docking and earth orbit operations, and 4264 m/s for injection towards L1, and 907 m/s for injection into L1. At L1, the vehicle would dock with the LSAM lander. The L1 option allowed global access to any point on the moon's surface, and full abort and return-to-earth capability at any time. Propellant transfer operations at L1 would allow use of a reusable, refuelable LSAM. Spare CEV's and LSAM's, propellant tanks, habitats, and other hardware could be cached at L1. Elements at L1 would have to make a station-keeping delta-V of 30 m/s per 100 days on-station. This created what Boeing called a 'spiral of extensibility', positioning hardware that could be used for later build-up of bases on the lunar surface, and then for expeditions for Mars, fueled by lunar-generated propellant. This was compared with NASA's LOR scheme, which involved throwing everything away,. From L1 to any point on the lunar surface, the LSAM would have to make a 907 m/s delta-V to move out of L1; 2199 m/s to land on the moon's surface, 2133 m/s from the surface back towards L1; and 999 m/s to brake into L1. A lunar base would be built up over time on the surface. Reusable base elements would include the LSAM, a habitat module, a 50 kW nuclear reactor, a lunar rover, EVA suits, and other ground elements. Eventually an ISRU plant could generate 15 metric tons of liquid oxygen/liquid hydrogen propellant per year, and 4.1 metric tons of water, sufficient to support two LSAM launches from the surface to L1 and back. It was assumed 243 two-crew EVA's would be made on the lunar surface per year. 20 metric tons of consumables and spares would be delivered to the base by two cargo flights/year. At L1, the crew would transfer back to the CEV. The CEV would make a delta-V of 1010 m/s for the return back to earth. A land landing would be nominal, with a water splashdown as a contingency. CEV: 26 metric tons maximum total mass, with a 5-metric ton mission module, 6.5 metric ton re-entry vehicle, and 14.5 metric ton service module with 9500 kg of lox/methane propellants. 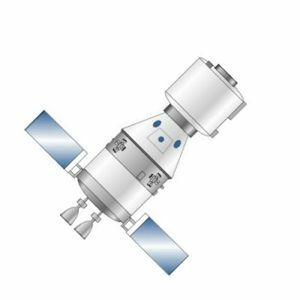 The mission module would be launched separately as part of the LSAM for the lunar mission. 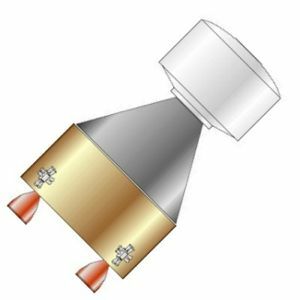 For earth orbit missions, much less propellant could be loaded in the SM and additional payload loaded into the mission module. LSAM: 34 metric tons total mass, including 28 metric tons of lox/lh2 propellants. On human lunar landing missions, the LSAM would carry the crew from L1 to the surface and back using a 5-metric ton mission module. For one-way cargo delivery missions, the LSAM would deliver 24 metric tons to the lunar surface. Specific impulse 455 seconds. EDS stages: each 45 metric tons total mass, including 38 metric tons of lox/lh2 propellants. Specific impulse 465 seconds. Crew Size: 4. Spacecraft delta v: 1,600 m/s (5,200 ft/sec). Family: Lunar Bases, Manned spacecraft, Moon. Country: USA. Agency: NASA, Boeing.